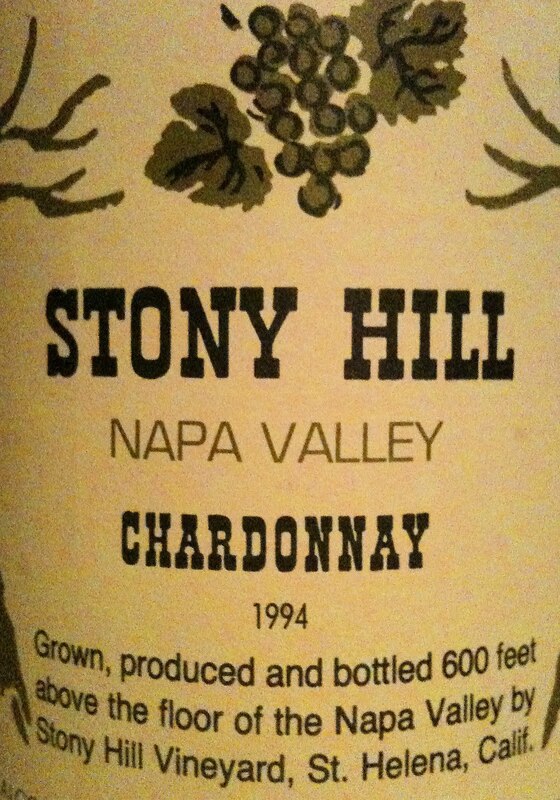 1994 Stony Hill Napa Valley Chardonnay, price unknown. This is the oldest vintage of Stony Hill that I've had, and this was a brilliant bottle. Delicious from the very beginning, but it was only after an hour open that this wine hit its apex. Elegant, well defined, and crystal clean aromas that showed a lovely harmony between rich roasted nuts, delicate flowers, and pungent mineral earth. Perfectly harmonious on the palate too, still showing hints of fruit, but more about grace and texture, and I loved the slightly oily, smokiness that lingered on the finish. 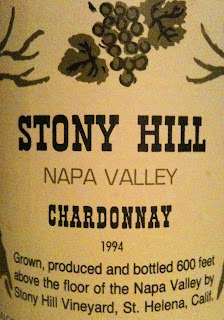 Stony Hill has for decades been making Napa Chardonnay that pleases the old world palate, and the wines are affordable. You won't spend more than $40 on recent vintages, and that's a pretty good deal for what I would say is among the very finest California Chardonnay. If you haven't tried Stony Hill, you should. 1996 Didier Dagueneau Pouilly Fumé Pur Sang, price unknown. I thought this was pretty astounding, although I liked it more than the other guys did. The wine was completely secondary and had very little to do with fruit. It was liquid rock, perfectly harmonious, and with a wonderful depth of aroma and flavor. I've never had a wine like it, never mind a Sauvignon Blanc like it. 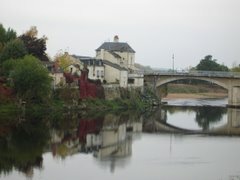 I wish that I'd been buying Dagueneau's wines back when I could have afforded them. 2000 Domaine de Montbourgeau Vin Jaune, $75, Imported by Neal Rosenthal Wine Merchant. A friend brought over a bottle that had been open for three days, and it was ridiculous. A chorus of strikingly pungent aromas and flavors, as if a friendly elf waved a magic wand and we were drinking the liquid essence of salted, curried cashews. Is this even made from grapes? Such harmony, so satisfying. 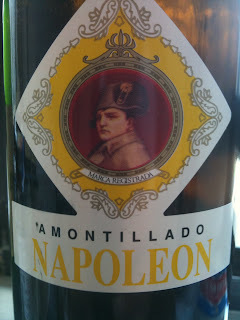 NV Bodegas Hidalgo Amontillado La Gitana Napoleon, $18 (500 ml), Imported by Classical Wines. This is the first time I've seen this wine in NYC, and I'm very glad for it. Further away from flor than other amontillados I've had recently, but not so much so. Almost delicate flavors of roasted salted almonds and toffee with a buttery hint to the finish. The texture is interesting in that it is here that I sense the flor character, the creamy feel. Only the slightly grainy and harsh textural element to the finish prevents this from being truly elevated wine, and it is a great value in amontillado. 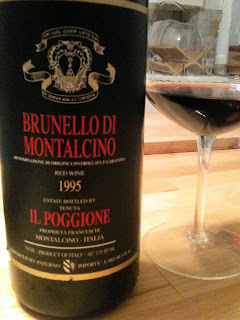 1995 Il Poggione Brunello di Montalcino, price unknown. Although this wine never finished opening up, the depth of material was evident. Tangled and intense flavors of cherry and licorice and herbs, with an earthy floor. 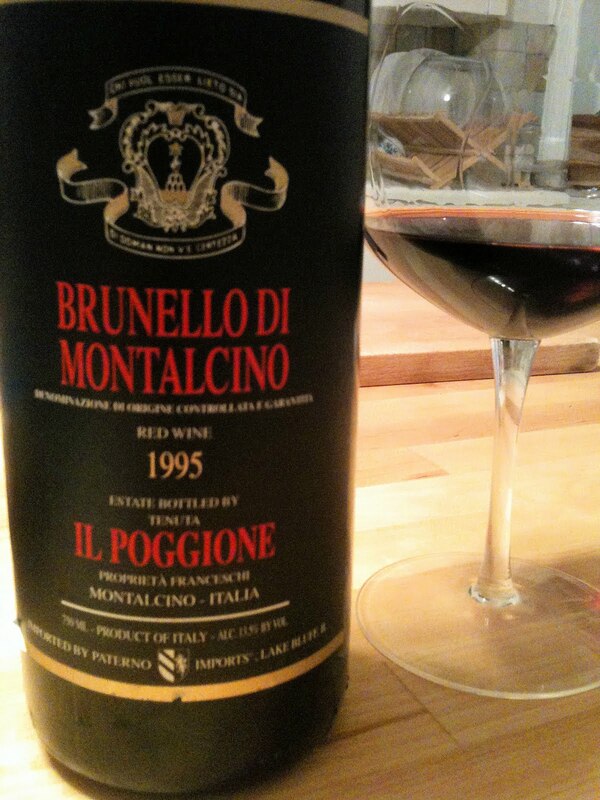 We enjoyed this immensely and it piqued my curiosity about the real Brunello. 1996 Cims de Porrera Priorat Classic, price unknown. We decanted this for over an hour and it was still unwinding when we moved on. 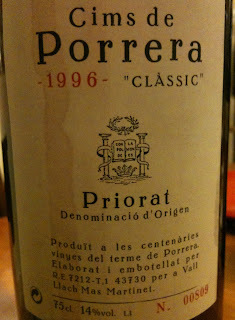 I have yet to love a Priorat, but this one was definitely interesting and very tasty. Rich, full in texture, deeply flavored, but not entirely well articulated. Still, with a bloody steak rubbed in garlic and thyme...not sure that I'd spend my own c-note on it but I'd happily drink it again. 1997 Noël Verset Cornas, $75 (purchased a few years ago). A fantastic showing, hit every possible aspect of its potential. There is a bit of rusticity, but not much, and the wine is perfectly harmonious. Vivid bloody brothy notes to the nose, along with stone and fur and hints of flowers. The nose evolves over a few hours in the decanter and continues to enchant, turning a bit olivey in the end. Beautifully structured - firm but completely smooth and gentle, and although there is not quite as much midpalate concentration as you might like, the wine is seductive and complex and vivid from start to finish. A great experience, and Mssr. Verset is sorely missed. Exposed - Asparagus and Red Wine. Common wisdom holds that it's very difficult to pair wine with asparagus. I'm not sure why this is so. Every spring asparagus flood the farmers markets for a month or so and I eat them like they're going out of style. Some wines work better than others, but this quest for perfection is kind of silly, I think. Not sure if you know this about me, but I do like to drink wine with dinner. And so every spring I try to be thoughtful about what wine, exactly, works best with asparagus. I've thought about the sweet grassy flavor and whether or not it works with fruit-driven wines. I've thought about exactly which type of Sauvignon Blanc would be best. A couple of years ago I came up with something that worked pretty well, the Crémant du Jura by Montbourgeau, a sparkling Chardonnay. I've tried many pairings and feel like I've done my due diligence. Hard boil an egg for about 3 and a half minutes, so the yolks start to firm but are still runny. 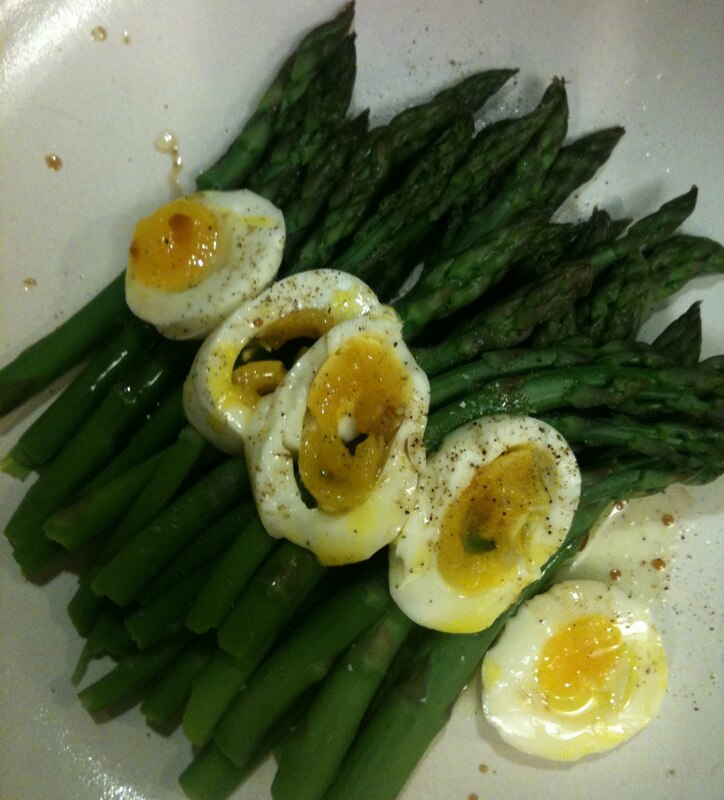 Drop the asparagus in salted boiling water for 2 minutes, unless you like them to be very soft. I like them to be a bit firm. How, you might be thinking, does he avoid the horrid pee smell if he eats firm asparagus? Here's how - using two hands, hold each asparagus at either end, and bend it fluidly until it breaks. It will break at the point on the stem where it stops being woody, and no further prep is needed. Drain the asparagus and plunge them into cold water to stop the cooking and to keep them bright and green. My new favorite thing is to top them with slices of this slightly runny hard boiled egg, very good olive oil, salt and cracked pepper. You can stop here, you can drizzle with vinaigrette, whatever you like. This time i used a couple of drops of good Sherry vinegar. 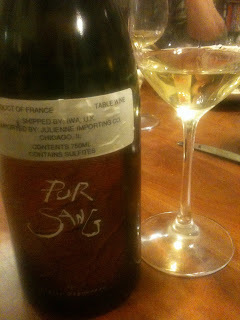 Puffeney's Trousseau is a wine that I've been drinking for only a few years, and with mixed results. 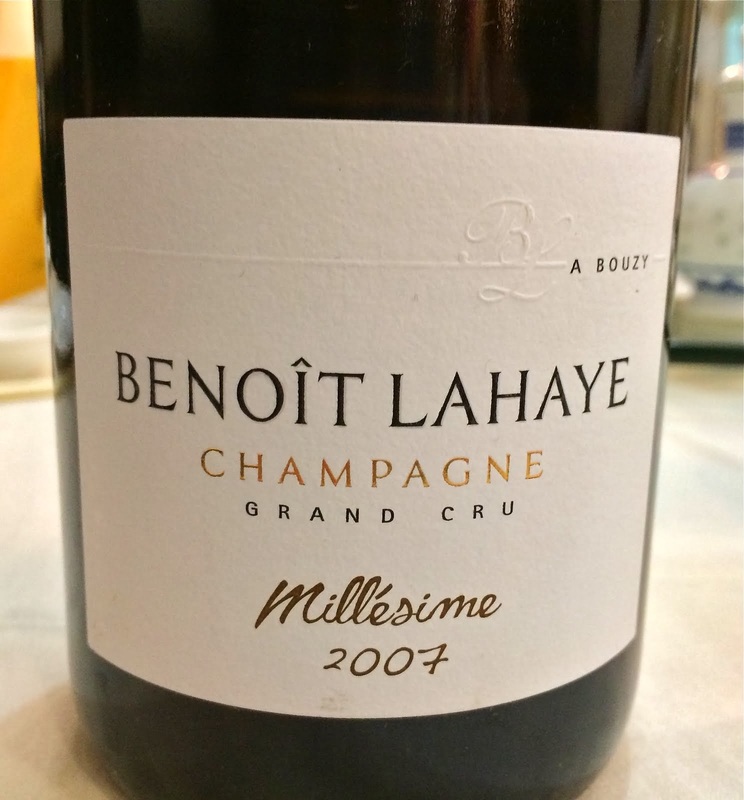 The good bottles are fantastic, and they supposedly age very well, but I've had a few bad experiences recently (2005, 2007) and became discouraged. 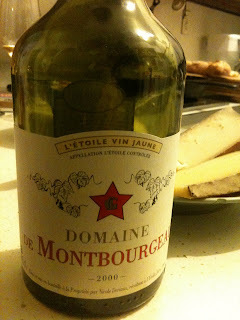 The other night I wanted a light bodied red wine with something of a woodsy character, and Puffeney it was. Wait - red wine...with asparagus? I'm not ashamed, people. The 2008 Jacques Puffeney Trousseau Arbois Les Berangères, $32, Imported by Neal Rosenthal Wine Merchant, if this bottle is any indication, is a great version of this wine. Initially the aromas are all bright fruit and dried leaves, and the wine has good intensity in a lithe frame. I like the tactile sensation, the graininess of texture. With time the wine harmonizes and becomes less about fruit, more about purple flowers, and very much about leaves, sticks, rocks, and moss. great acidity and balance, delicious wine - exactly why I get excited about and buy this wine. Day 2 was truly excellent, by the way. And honestly, it was great with the asparagus. Okay, it wasn't all harmony and unity, but the smells and flavors were interesting together and worked well, and I enjoyed my meal. Isn't that enough? The other night I met a friend in Chinatown for dinner and we both brought a bottle of wine to share. This guy is a relatively new friend. He has been in the wine business for a long while now and he has the opportunity to taste an awful lot of wine, new vintages and old. There are only a couple of people with whom I'm friendly enough to meet for dinner and who have the kind of wine experience and knowledge that this guy has. I've noticed that they all have one thing in common - they always serve or bring one of the best versions of whatever wine it is we are drinking. In other words, if we're drinking Nuits St. Georges, he'll bring Chevillon Les Saint Georges. If we're drinking Vouvray, it's Huet. It's not bluster or anything remotely like that. It's the product of years of professional and personal drinking, thinking, tasting, visiting, and discussing. It's just a matter of knowing, with great experience and conviction, what it is that he actually wants to be drinking. Anyway, on that night we were eating at a restaurant specializing in Shanghai food. We ate several kinds of soup dumplings and various cold appetizers. I brought a Chablis, the 2008 Gilbert Picq Chablis 1er Cru Vogros, $29, Polaner Imports. 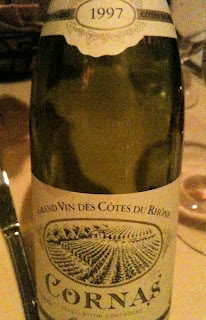 I love the Picq wines and this is my favorite of them, and 2008 is an excellent vintage in Chablis. This wine, however, was entirely shut down and way too young. I could have predicted that before bringing it, but I kind of refused to bring yet another Riesling to yet another Chinatown dinner. My friend brought a bottle of Beaujolais. 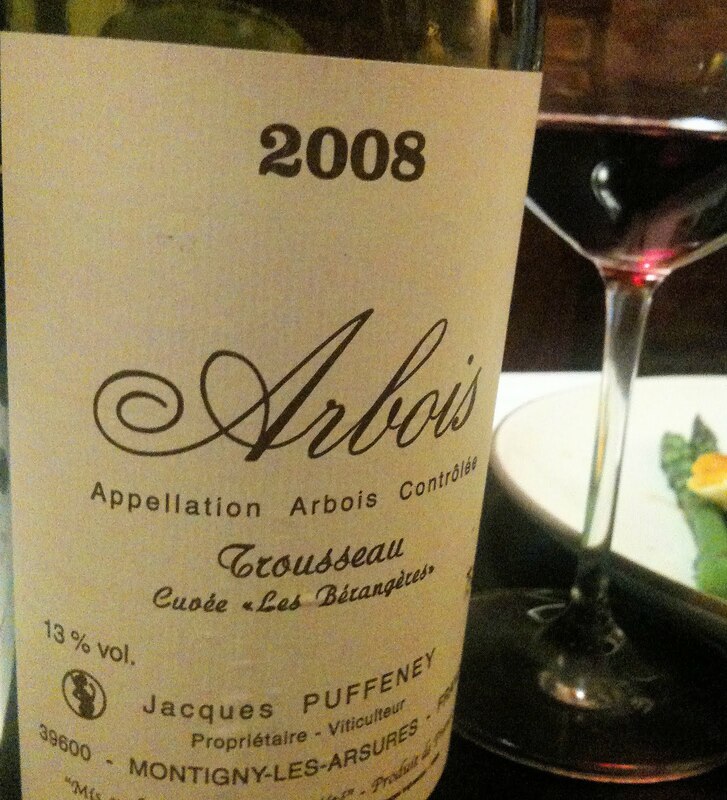 It was fantastic wine and I learned something fundamental from it about the terroir of Fleurie. I always thought of Coudert's Clos de la Roilette when I think of Fleurie. My friend brought a bottle of 2008 Yvon Métras Fleurie, price unknown. In a way it's hard to compare the two wines because Coudert is made more in the Burgundian style and Métras is carbonic, but still, the differences in terroir are clear. You've had Coudert's Fleurie - there is a certain density that perhaps you can think past for a minute, and think of the flavor - muscular, dark, smokey, and rich with a strong mineral underpinning, like iron. As I read here, the soils the birth Clos de la Roilette Fleurie actually are adjacent to the the border of Moulin-à-Vent and as in Moulin-à-Vent, they have a lot of manganese and clay. Maybe Clos de la Roilette wines are more representative of Moulin-à-Vent than they are of Fleurie. 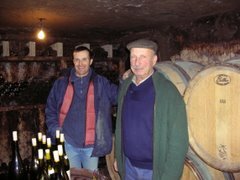 Yvon Métras' vineyards are more typical of Fleurie, and the 2008 Fleurie showed an entirely different character from any Coudert wine that I've ever drunk. Yes, the wines differ texturally, but that might have as much to do with wine making as with terroir. 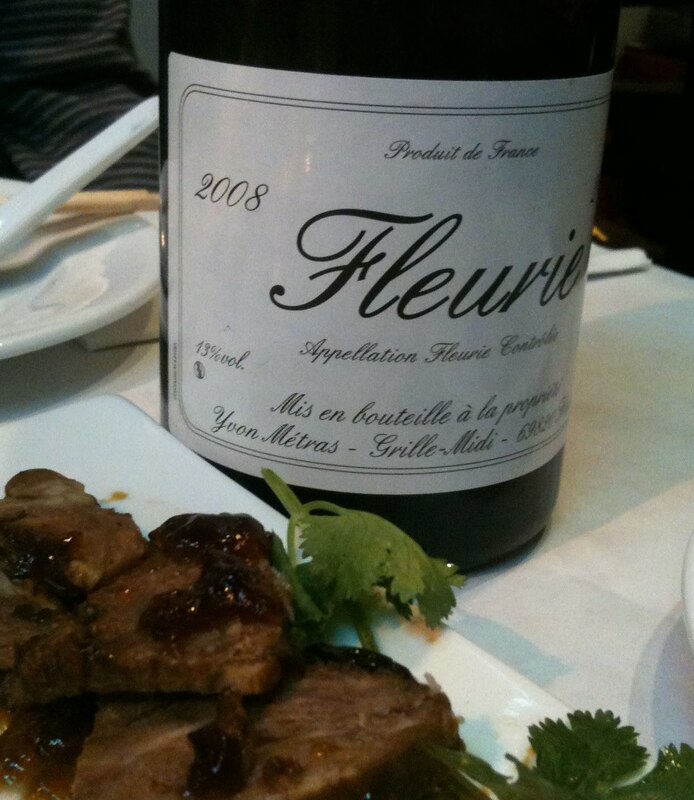 The flavors of the Métras Fleurie were entirely different, delicate, bright red, spice-inflected, faintly herbal. The overall package is one of elegance, grace, intensity, and purity of flavor, and I cannot remember drinking a more compelling and delicious Fleurie. It was particularly delicious with aromatic beef, braised with star anise, among other things, and served cold with some sort of aspic. Maybe from now on I'll think of Coudert's as the finest Moulin-à-Vent that I've ever had. I met a friend the other night at a wine bar. Not a place that is well known on the internet or among wine people for its great list, not well known for anything except as a neighborhood place. A good place to meet a friend and enjoy a glass of wine together. I was waiting at the bar for my friend to arrive and three people sat down next to me. They told the bartender that they had just eaten dinner and would now like to drink some wine. They looked at the list and the bartender came back to ask what they'd like. "I don't know," one of them said. "Tell us about the wines you have." "Well, what kind of wine do you like to drink?" She asked. "I like red wines that are big but not too dry," he said. "Well I have something you might like," the bartender said. It's not too dry and it has a bit of leather to it. Would you like to taste it?" "Sure," they said, and the bartender poured them each a generous taste. I could be wrong to feel this way, but my guess was that the customers wanted to enjoy their wine, they were not wine connoisseurs, but they were interested in wine and want to interact with the server about wine before making their choice. When you begin offering tastes, more tastes of more wines might follow, and the whole interaction can take quite a bit of time. This is not an easy moment for the server, I would think. Some discussion followed the tasting. "I like this, what is it?" One of them asked. "It's a Faugères," she said. "I like leather," one of them said, and lots of giggling ensued. This group of three people went on to sample three more red wines, including a Douro, a Chateau La Rame Bordeaux, and something else - I cannot remember what. All wines that would retail for something like $15, all poured for about $8 by the glass. Lots of back and forth, smiles everywhere, the bartender patient and engaging. The Faugères was actually re-tasted. They each chose a different wine, thanked the bartender, and were happy. I must say, I enjoyed watching this tremendously, and I had a front row seat. I was impressed with the bartender. She clearly enjoyed this interaction too, enjoyed her work with customers. And yes, the bar might not have made as much money on the sale because something like two or three glasses of wine were poured for free as tastes. But the customers were happy, they enjoyed the experience, and perhaps they will return. If you're reading this blog you probably read other things about wine, and you probably drink a lot of wine, maybe even collect wine. The bulk of the wine sales business doesn't involve us, though. Most of it is between retail clerks and servers, and customers like those three people. It was nice to see that it still works smoothly, and it was oddly calming to me to see that anyone can go into a NYC wine bar and take pleasure in talking for a while with a knowledgeable and patient server about $15 bottles of Douro and Faugères. All is safe in the wine world, now go to sleep. Sorry I've been missing in action. Lots of changes in my life and I simply haven't had the time or energy to write this blog. Be back as soon as I can. Thanks for checking in.